As such even when completed and sold we will leave them on the list as inspiration for short, simple trains that you may want to tackle yourself or leave us to do for you subject to items still being available and a new "Train of the Week" should be added every Thursday and we intend changing the era and type of train to keep it fresh and different. This weeks Train of the Week was inspired by the annoucement last week from Heljan of the lower of the price of their remaining GUV and BG coaching stock; admitedly this project was already underway at the time but it turned out the be perfect timing! We have previously featured this train utilising maroon examples of both vehicles for use with either steam or early deisel which can be found in the archive from last year but we decided we wanted to show the train in the later era as well. Here we are showing two of the Heljan BG's in Newspaper livery along with two of the Express Parcels GUVs, all numbered and weathered along with one of the new Heljan Class 25/3 to haul them. Both type of vehicle are incredibly versatile pieces which could be found as either part of a passenger train, as a dedicated parcel train like this, attached to a fitted freight train, milk train or even hauled by a single car DMU. The set of four coaches alone are approximately 67" long and then there is whichever locomotive you wish to put on the front. The parcel stock also comes in a variety of liveries enabling you to give a more region feel with either the chocolate and cream or southern green liveries or the later Parcel Red and Royal Mail liveries. Also at the workshop being completed for the shelf was an example of the Heljan Class 40 in blue and it would of seemed a shame not to take the oppurtunity to photograo it at the same time. Rather than suggest a cost for the entire train it seemed better to give the options on the individual units, either as they come un-numbered or weathered from Heljan or with the options or numbering and weathering and there are plenty of suitable locomotives out the to finish off the set. Just as a reminder, there will not be a Train of the Week next week as the workshops are taking a well deserved week long holiday, the next installment will be the 28th of April. We are looking forward this week and thinking about the forthcoming Heljan Class 37/4 that is due for release hopefully before the end of May. The release of the new Heljan 37/4 will see some of the more interesting later liveries being released. The only problem is available stock to go with these later liveries. On that basis we did look at the Heljan VDA in EWS livery to go with the forthcoming 37/4 in the same livery as a future Train of the Week. Talking to Heljana few weeks ago though we did double check on the stock situation on the EWS liveried VDA's to find stocks were very low so jumped in and bought the last of them and sent seven straight off to the workshops for weathering. All well and good but then we didn't have a loco in EWS to feature with the wagons but a customer came to the rescue who we had done some work for in the past with one of the Heljan Class 47's we had repainted in the past as Ribblehead Viaduct and also a Class 66. The train came out rather well we think and gives a good impression we hope of an ideal train to make up using both the forthcoming Class 37/4 and VDA's. At the end of the day the customer also bought the rake of vans off us but we still have limited stocks of these so could repeat it again for anyone who is interested whilst stocks last as we may well sell our before the 37's are launched. We are also taking advance orders for the Heljan Class 37/4 for despatch as soon as they become available. Details of the forthcoming Heljan Class 37/4's can be found though this link Heljan Class 37/4s. Good news as well, I spoke to Heljan today and the locos are in production in China and on target for the expected release date around the end of May. I will be doing a Train of the Week next week but after that the minions in the workshop will be taking a holiday for two weeks around Easter so we will be taking a weeks break from this feature after the 11th of April with the next expected update on the 25th. Following on from last week is another iconic San Cheng locomotive in the Stanier 8F 2-8-0 shown here in BR late crest and heavily weathered. A large number of 8F's were built and used as a heavy freight engine and saw extensive use all over the system includiung overseas both during and after the Second World War. We have shown it here doing the mainstay of freight work from the era with a 16 ton mineral train. Sadly when it came to downloading all the images, this one is sadly a little blurred. The 8Fs were successful and durable locomotives in BR service, with all 666 locomotives surviving until 1960 and routine withdrawals not beginning until 1964. The first to go in 1960 was 48616, followed two years later by 48009. 48773–48775 (the former Longmoor Military Railway locomotives which were the only 8Fs on the Scottish Region) were also withdrawn in 1962, but these were reinstated into London Midland Region stock in 1963. The remaining 664 were withdrawn between 1964 and 1968, with 150 surviving to the last year of steam on BR. To finish off the train we went for another of the Dapol BR standard brake vans, again weathered just to complete the train. The San Cheng 8F is another of the very desirable locos they produced and we have just a few left of these, one with the BR early crest and another with the BR late crest. Once gone we will sadly not be able to replace these. As to an overall length of the train, we had it on our small layout with ten 16 ton minerals and it looked good but equally if you had the space as a heavy freight loco it would of happily pulled twenty or more freight wagons. We had previously done a rake of 15 bauxite 16 ton minerals for a customer but we struggled fitting in more than 12 on the layout. We have recently completely one of the old Bachmann Brassworks (San Cheng) LNER / BR J94's for a customer; numbering it, weathering it and even sound equipping the loco to the customer's requirements and thought it would be nice to feature one of these as in the North East of England on shunting duties with a variety of wagons which we have also been weathering through the workshops either for stock or for customers. Over the years a number of people have stockpiled locos with the intention of completing them at a later date and time being what it is, many do not get completed. It is never an issue fully finishing locos such as this at a later date, as we have done here. The Bachmann Brassworks loco is sadly no longer available but there are still plenty out there and they do come out rather nicely. The likes of the J94 were suited to shunting work or short distance runs are is shown here with a variety of Dapol wagons,; the ever popular 16 ton minerals which are available in a several liveries spanning pre and post Tops with one of the Dapol BR standard brake vans and then the relatively new Dapol 10 foot wheelbase BR vans whcih again come in various liveries. At the back of the yard can be seen a rake of Heljan Class B tanker all of which have been weathered to give a feel for the period rather than the clinical clean look. In the case of the J94 shown the cost of numbering, weathering, painted the backhead and supplying the plates of this factory painted black locos was £100.00, other locos are obviously subject to the work involved. The workshop has recently completed one of the San Cheng Royal Scots in BR green and this was again too good an opportunity to miss for Train of the week shown here with four of the Heljan maroon BGs and GUVs that have been lightly weathered in what was an iconic train often seen on the rails in the period. The San Cheng range of brass ready to run locomotives have always been popular and good runners, it is just a pity they are getting harder and harder to come by with reducing stocks since the closure of the factory in China and they represent excellent value for money when compared to the Korean Brass locomotives out there. Both type of Hejan parcels vehicle are incredibly versatile pieces which could be found as either part of a passenger train, as a dedicated parcel train like this, attached to a fitted freight train or even hauled by a single car DMU. They could also be seen attached to a milk train for the transportation of churns. The set of four coaches alone are approximately 67" long and then there is whichever locomotive you wish to put on the front, be it steam or deisel. The parcel stock also comes in a variety of liveries enabling you to give a more region feel with either the chocolate and cream or southern green liveries or the later Parcel Red and Royal Mail liveries. Rather than suggest a cost for the entire train it seemed better to give the options on the individual units, either as they come un-numbered or weathered from Heljan or with the options or numbering and weathering. We have just completed a custom repaint on one of the Heljan Class 31's into Railfreight Triple Grey (Coal Sector) for a customer and thought the opportunity was too good to miss so we photographed it along with a rake of matching Dapol HAA Hoppers. A merry-go-round train, often abbreviated to MGR, is a block train of hopper wagons which both loads and unloads its cargo while moving. In the United Kingdom, they are most commonly coal trains delivering to power stations. These trains were introduced in the 1960s, and were one of the few innovations of the Beeching reforms. West Burton Power Station was used as a testing ground for the MGR system but the first power station to receive its coal by MGR was Cockenzie in Scotland in 1966. It was estimated at the time that the 80 MGR hoppers needed to feed Cockenzie would replace up to 1500 conventional wagons. By the end of 1966 there were about 900 wagons carrying 53,000 tons a week to four power stations. Power stations that were built to handle the new MGR traffic were Aberthaw, Drax, Didcot, Eggborough, Ferrybridge C,Fiddlers Ferry and Ratcliffe, of which the former and latter pairs are still open for traffic. Many of the older power stations were also gradually converted to MGR operation. Merry-go-round operation was also adopted for the Immingham Bulk Terminal built in the early 1970s to supply iron ore to the Scunthorpe Steelworks from the Port of Immingham. The two prototype wagons, 350000 and 350001, were built at Darlington works in 1964 and 1965 respectively, following which several large batches were constructed at the nearby Shildon works. With the exceptions of the two prototypes built at Darlington and the 160 wagons built at Ashford, all 10,702 HAA wagons were built there. With over 10,000 produced they were an iconic wagon of the The decline in the UK mining industry from the 1980s onwards made many of these wagons redundant. The last location to have coal delivered by MGR wagons was the Hope Cement Works in August 2010. The livery of these wagons was of unpainted metal hoppers and black underframes. The hopper support framework was originally brown, then red with the introduction of the new Railfreight image in the late 1970s. When Railfreight re-invented itself in 1987, a new livery with yellow framework and a large coal sector logo on the hopper side was introduced. The Dapol HAA's are currently available with the red and blue cradle but have sold out of the brown cradle livery. Dapol themselves have also sold out of the yellow cradle Coal Sector livery but we have just 13 left in this livery which can be sold clean or custom weathered. The Heljan Class 31 was originally a standard green model that we have fully resprayed to the customer's requirements. Although the Heljan Class 31 is currently sold out Heljan have announce a limited re-run of these for later in the year which we are taking advance order for now in a total of six liveries, several of which are new and have not been done before. Hectic this week with Kettering show this weekend and the workshop have also been working hard to complete various trains. As a result I now have a catalogue of the next 4 weeks "Train of the Week" ready to go at least. Here we have one we have not done before with one of the new Heljan Class 43xx Mogul's in BR early crest livery along with one of the Dapol 4 car suburban sets. Here we have used one of the Dapol four car suburban London sets of coaches in BR maroon and have lightly weathered the whole train which has really added character to the set. These coaches are available in both two and four car units in both Great Western and BR liveries with specific regions for the sets available covering London, Birmingham, Cardiff and Bristol as example. Back to a steam theme and sticking with a clean appearance for this short train. There is little available ready-to-run for the Southern region but we thought it worth focusing on this region for once utilising what stock there is available. Here we have used one of the ever popular Dapol Southern liveried "Fishbourne" Terriers along with a mix of Southern 5 and 8 plank opens. Completing the train is one of the Dapol Southern liveried Pillbox brake vans with an overall length for this train of approximately 95cm, so just over 3 foot in length. The Terrier, Pillbox brake vans and open wagons are available in a good number of liveries and makes a nice short light goods train and can be depcited in a number of time periods and looks good either clean or weathered. Back to the concept of short, realistic trains again this week and one I have been wanting to do for a while and with a delivery from the workshops of new stock items made it possible We are showing here a clean example of the GWR liveried models and then a lightly weathered example of the BR Crimson and Cream livery. The Razor Edge Railcar is a complete train in just a single unit and equally at home on a small end-to-end layout or a larger layout. In February 1939 the G.W.R. announced 20 new railcars The fleet would consist of 15 single passenger. cars, one express parcels car and two twin car sets. Previous Railcars had been of a streamlined shape and the new type cars would be much more angular which quickly lead to them being nicknamed Razor Edge Railcars. The chassis were built by A.E.C. and powered by two A.E.C. 6 cylinder engines. As built there was a drive shaft connecting the axle boxes on the powered side of the bogie at opposite sides on each end. These shafts were removed in B.R. days. The bodies were built at Swindon and the chassis’s were delivered there for final assembly. Maximum speed was 64 m.p.h. and the Railcars were used over a large part of the G.W.R. system, particularly in the Midlands, Oxfordshire, Bristol and Wales areas. As built the Passenger Railcars were painted G.W.R. chocolate and cream. Lining was applied around the chocolate panels and the Railcars carried the G.W.R. roundel or “shirtbutton”. The roof was originally painted white. In B.R. days the Passenger Railcars were repainted standard B.R. coach livery of carmine and cream with simple waistband lining. They were originally renumbered W19 to W33 but this quickly became W19W to W33W. This numbering system was retained until they were withdrawn. The final livery carried by the Passenger Cars was the familiar B.R. green with “Cat’s Whiskers” from 1958 onwards. During the B.R. period the roof colour was anything from light grey to dark grey. The Razor Edge Railcar stands at just over 46cm in length but as with many of the similar units around at the time could also be seen with either a BG, GUV or milk tanker behind it. This model is from the Tower Brass range and is either available in plain brass or fully finished as per the examples shown here. Details of the Tower Brass Razor Edge Railcars can be found through this link. It is also worth mentioning that Heljan also intend producing a model of this loco in late 2019 or 2020 which we are taking advance order for now. Details of the Heljan AEC Railcar can be found through this link. We had to think long and hard about doing this one. The workshop is very busy at present completing Heljan Class 43xx Moguls for customers and had little spare time. Last week we featured a CWS Milk train which a customer was inspired by but wanted the theme of the Dapol United Creameries silver tankers. Torrington had both a SR and WR route for milk traffic, both travelling via Exeter and the above image nicely shows just how dirty the milk trains can get. There is also a very interesting article on Torrington milk traffic which can be found here Torrington Milk Traffic. One line I found particulary interesting in there is up to six milk tankers being added to a passenger train for mixed freight and passenger service and may be why the customer ordered a total of six with the sheer volume of traffic through the day and also the mention of latter deisel era with milk tankers mixed in with clay trains. Following on from last week is another tanker train but this time for milk traffic in the steam or early deisel era. This has also been an interesting train to research. Would of made me cringe to say "Milk for London" because really it could of been any major city. We have put together a rake of the Dapol CWS 6 wheel milk tankers along with on of the San Cheng Manor class 4-6-0's in BR early crest lined green livery. CWS had private siding serving a dairy in Melksham (WR) and a loading facility in both Llangadock (WR) and Wallingford (WR). These served discharge point at Stewarts Lane and East Croydon, both on the SR so this could represent the shunting and creation of the train or a short train in transit. By the 60's CWS was under the United Dairies Label. As to weathering, I always assumed the milk traffic fleet were kept relatively clean but looking at images they could almost be black with grime. We have gone relatively light weathering which has just highlighted the strapping detail which otherwise is lost and a very light sheen around the centre of the tanks for overspill. Obviously each are slightly different levels as they would not all be exactly the same degree of weathering. The individual cost for these if we were to do them is £95.00 each (£70.00 plus £25.00 for the weathering.) and the train could be as long and short as required. To finish off the train we have a weathered example of the Dapol BR grey 20 ton brake vans. Last year we featured a short rake of just six milk tankers along with a BR black 64xx Pannier Tank rather than a mainline milk train destined for the busy cities and did not feature one of the brake vans as it was only assembling the milk train ready for a heavier loco. The overall length of this train as it stands is just under seven foot but as previously mentioned this could be as long or short as you have space for and this could also be reproduced based around any of the standard liveries of the milk tankers produced by Dapol as either clean or weathered finish. It would be acceptable to see the odd clean United Milk tanker mixed in with a rake of CWS milk tankers once the company was taken over for example. Another interesting and popular theme is petroleum traffic from all over the UK in both the steam and diesel periods and we have just completed a set of the Esso petroleum tankers. Loco featured here is one of the Heljan Class 45's as D59 "The Royal Warwickshire Fusiler" along with ten of the Heljan Esso tankers. This was always the most popular of the liveries of the Heljan Class B tankers and has now completely sold out so we decided to use the very last set of these to complete this impressive looking tanker train. Then we have weathered them and used artistic license to show a degree of the oil staining. 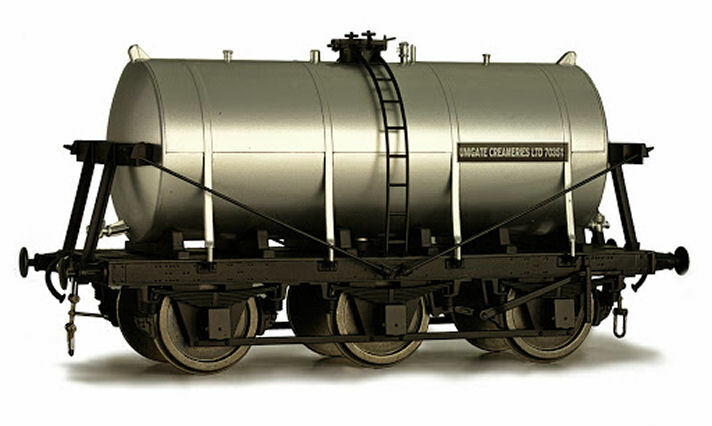 In reality many of these tankers were so heavily stain with oil spills that you cannot even see the lettering but this is really effective at showing the overall character of the train without over doing it. The whole train is just over 7'3" in length overall with the set of ten tankers. There are still other liveries of the tankers available; Regent and Mobil the other options available that can always be completed to order as the Esso set has now been sold. As we always say, this is only shown to spark ideas and show case what can be done, if you have space for more or less tankers it still give a good impression of the overall appearance. We will be revisiting fuel tankers but in the steam era before Easter with the release of our two Limited Edition sets of the Dapol Air Ministry Class B tankers in both Esso and Shell BP liveries. Details of theTower Air Ministry Class B tanker sets can be found through this link and we will be offering a weathering service on these along the lines of the above tankers including the oil staining for an additional £150.00 for the set of six. Following on from the limited re-run of Heljan Mk1's received last week we thought it was worth looking at these whilst they are still available. The popular Heljan Mk1 were produced about 5 years ago and .have been sold out for at least 12 months. Following several requests they have done a small and limited re-run of just eight vehicles with the best selection being the BR maroon livery with four versions available enabling a full train. There is also a new lower price on these coaches compared to the original issue price from five years ago. We are showing here the Mk 1 coaches with one of the Heljan Class 42 Warship diesels, going for a factory numbered and named green example "Kelly". We went for this Warship as a maroon example just looked all too "red" for the whole train. There are currently ten versions of the Warship available including five of the Tower Models Limited Editions which are un-named and numbered so customer's can choose their own choice of iconic name. The overall length of this train as it stands is just over 90 inches with the four coaches as the individual coaches are just over 47cm each. If you were going to go for less than four coaches I would recommend the Dapol suburban coaches over the Mk1 coaches which, although used on suburban services, would usually not be used on such small trains. Talking to Heljan it does look like longterm Heljan will reintroduce more of the original range but this is subject to how well this limited re-run goes with the full range of Blue Greys next on the list to supplement the TSO that has just been re-released in blue grey. There should also be more news on these around Telford show along with some new liveries if everything goes to plan. This week we have gone for a short train based around the distinctive Railfreight grey era of 1982 through to 1987 and features one of the Heljan Class 20s and a mix of Heljan OAA's and VDA's in matching Railfreight Red-Grey livery. This era is gaining in popularity and this is the third attempt we have made to get this onto train of the week with each time previously the train selling before we could feature it. Each time before it was four of the opens and only one van being effectively used as a brake van at the opposite end to the loco. This time we have completed it with 2 of the Heljan vans. As a side point, we have just tried to re-order some of these VDA vans from Heljan and they have now sold out so we are limited to whatever stock remains here on the vans. Stocks on both versions of the OAA are still okay. The loco and stock have all been numbered and weathered. Although weathering is not to everyone's taste it, even with a very light dusting, does take the "plasticy" sheen from both the loco and stock. 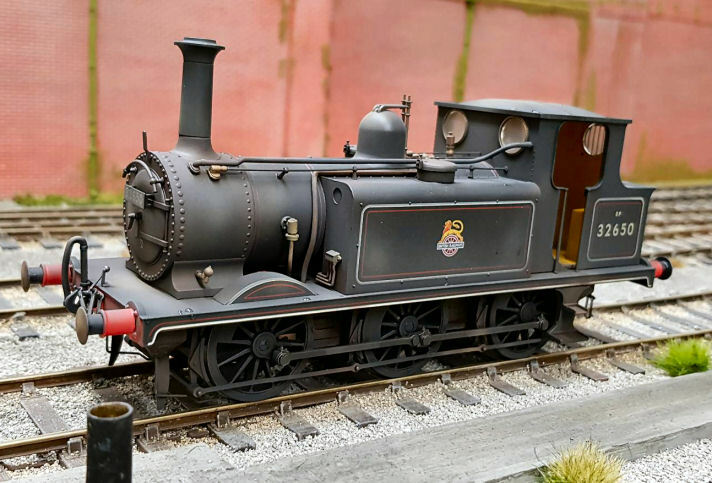 The overall length of this train as it stands is around 74 inches but obviously could be done as a shorter or longer train if required but looks effective and realistic even at just over 6 foot long. We have also been asked about completing just singles of the shown rolling stock which it is always no problem to do if required so I have listed a price for these too. This obviously also applies to any of the wagons shown in previous weeks that we have featured. Mix of two VDA's and four OAA's all weathered with different numbers. Heljan Class 20 Railfreight numbered and weathered with a mix of 6 VDA's and OAA's with different numbers and weathered.